As producers prepare to sweep away the last vestiges and vertebrae of Spider-Man: Turn Off The Dark, talk has already turned to what show could possibly replace it at the Foxwoods Theater, and remove itself from the shadow of its previous, incredibly messy tenant. 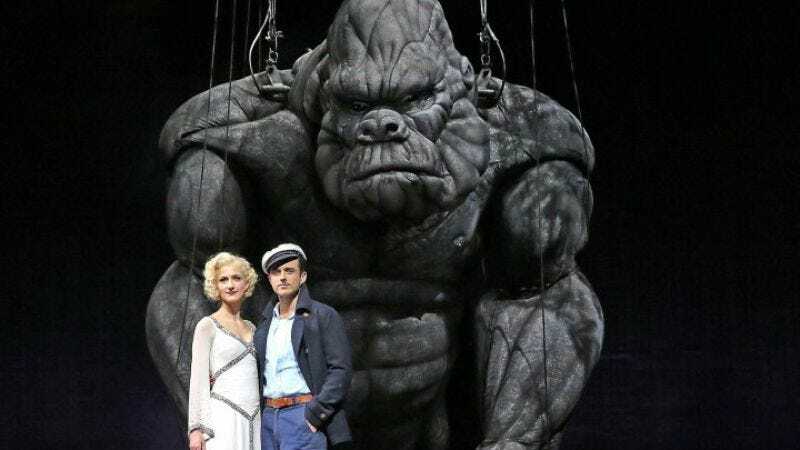 According to the New York Times, it’s King Kong, another massively scaled, effects-driven musical based on a pop culture icon—one whose previous run on Broadway also ended in a lot of screams and people getting hurt. Nevertheless, producers seem confident that King Kong is “a natural fit in New York,” having apparently never watched King Kong (or even that one episode of The Simpsons) all the way through. Their chutzpah is slightly reinforced by the fact that King Kong is already enjoying a successful run in Australia, where audiences thrilled to its giant, animatronic gorilla and a songbook that features contributions from Sarah McLachlan—presumably a rendition of “Angel,” in the most heart-wrenching appeal to prevent enormous ape abuse you’ve ever heard. King Kong is expected to make his return to Manhattan in December, where this time, if things go terribly, Turn Off The Dark-level awry, we suppose they can always write it off as part of the act.